We have been co-ordinating and running a number of sessions over the last 6 months which have involved engaging serving members of our armed forces and serving chaplains, with diverse and mixed communities across London. The work has involved holding numerous events in boroughs across London and we have also produced the following booklet as part of the ‘Building Our Futures Together‘ project. Further information on the Bridging Our Futures Together project can be found through this link to the armed forces project.After the murder on the streets of Woolwich of Lee Rigby in May 2013, it became clear to us that a lot of work needed to be undertaken to ensure that a wide range of communities engage with our armed forces and that communities tackle some of the perceptions that may affect their views of our armed forces. We are aware that some people do not agree with conflict and they have strong reasons for not engaging with our armed forces. We also understand that some conflicts may have affected perceptions of our armed forces and the booklet below addresses some of these issues.In fact, our engagement with this project showed us an institution that is undertaking a process of change to be reflective of the communities it serves and protects, yet it conducts the will of Parliament and our serving men and women are led by the will and decisions of politicians. We were also pleasantly surprised to find that, for example, there are over 840 serving soldiers in our armed forces who are also Muslims and this is a fact that is not highlighted enough, nor is the fact that there are serving soldiers from a variety of different faith groups. Many of these soldiers from our armed forces served in Afghanistan, Iraq, Kosovo and Bosnia and helped in ensuring that civilians were protected and that refugees were also protected in their plight to safety, sometimes from genocide, as in Bosnia. Whilst we understand that serving men and women in our armed forces go into conflict areas and sometimes have to do so with force, there are also a range of other functions that our armed forces undertake. 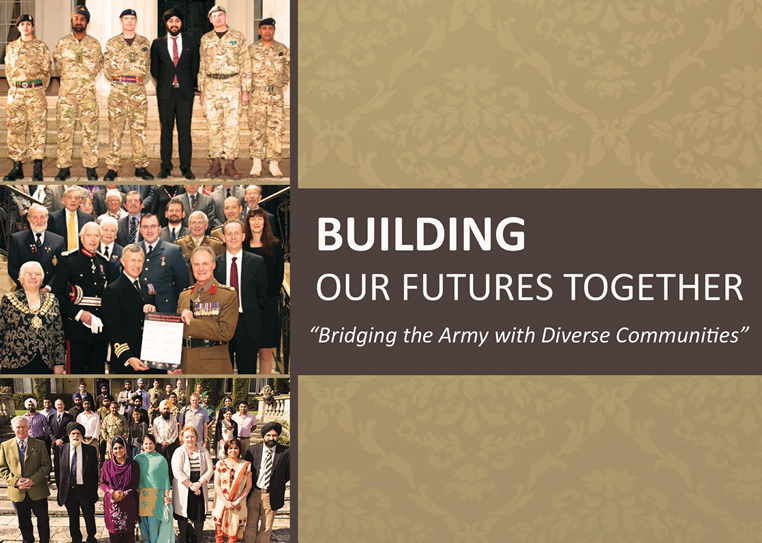 The Building our Futures Together project is therefore an opportunity for interested members of communities to engage in dialogue with and be aware of the diversity of serving soldiers in our armed forces; and for our armed forces partners, it is a chance to reach out, confront some stereotypes and listen to the views of different communities. We therefore hope that the booklet below can be a resource for you if you are looking to hold engagement sessions between serving members of our armed forces and community groups. If nothing else, we hope that inspires you to want to ask questions and to want to find out more. You will be surprised as we were, as to the willingness of our armed forces to engage and to be part of wider discussions. Finally, the last thing we all want, is to see such brutality and murder on our streets where a young man simply walking the streets of our capital is killed just because he has served in the armed forces. Such hate should never again have a part to play in our capital and we hope that the Building Our Futures Together project, can play a small part in reducing such threats in the future.